Updated with New Photos and Video. 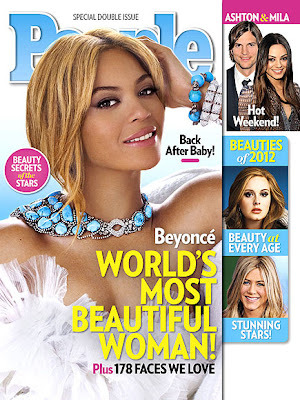 Beyonce has nabbed the cover of People Magazine's World's Most Beautiful Woman issue. The 30 year old superstar told People magazine that motherhood makes her feel more beautiful she said "I feel more beautiful than I've ever felt because I've given birth... I have never felt so connected, never felt like I had such a purpose on this earth." Read on to see more photos of Beyonce from her People magazine's photo-spread and read what the superstar shared about her daughter Blue Ivy. Plus see the other stars who made the People Magazine's Most Beautiful 2012 list. "She's just the cutest thing... She looks like Blue... She's her own person... The best thing about having a daughter is having a true legacy," she adds. "The word 'love' means something completely different now." Watch more videos on our YouTube channel LushFabGlamTV. She looks better in the video than the photos too much photo shop.